One day my elder daughter asked me to make a marionette. That's why this birdie was born. It's made mostly from all kinds of waste — bottles, lids, fabric scraps etc. Well, let's start. 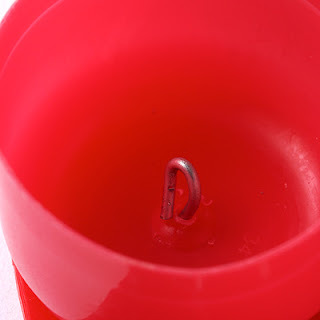 Cut two feet out of big (red) plastic lids, like those used for infant formulas. Pierce a hole in each of them. Take two plastic egg shells and make holes in their ends. Attach two halves of the shells to the feet using wire, a half per one foot. Make loops in both ends of the wire to do this. String the remaining halves along with other shells onto two shoe-laces, one half and three whole eggs on a shoe-lace. Tie knots inside the halves and between the shells to make the legs more flexible. Leave lose ends in the upper part of the legs. Put together the parted shells to attach the feet. The legs are ready. We used the upper part of a plastic bottle for the body. Make two holes in it to attach the legs later. Cut a cloth big enough to wrap the body and make a tail. Make in it holes right opposite the holes in the bottle, then thread the shoe-laces with legs through the holes and tie knots inside the bottle. Now take a bottle cap, make a hole in the middle, thread a wire and make a loop inside. Put the cap into the bottle, push the wire through the bottle neck and pierce the cloth. Thread the wire through a hole in an egg shell, pull it and make a loop inside the shell, so that it gets attached to the body. Gather the fabric together behind the body using a ponytail band. Make the neck exactly like you made the legs and connect it to the body putting together two halves of the shell at its end. Open the shell at the other end and tie a knot inside. It's other half will be connected to the head. 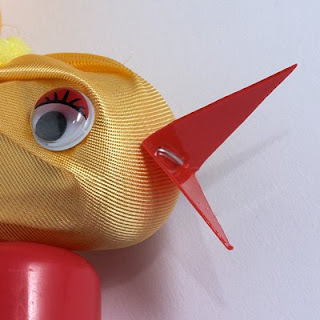 Make the beak from the plastic lids, too: cut a rhombus, fold it, make two holes for a piece of wire. Use another egg shell for the head. Cut a cloth to drape the head, pierce two holes in the shell an in the fabric, attach the beak and twist the wire inside the shell(open it to do this). Make another hole in the wall of the head (its rear part), pierce the fabric and connect the head to a half of the shell left after making the neck. Put together the two parts of the shell. 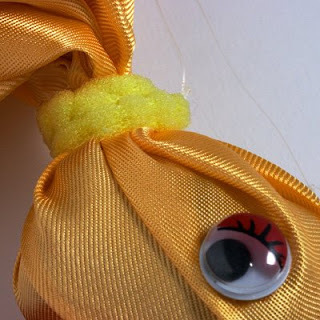 Gather the fabric together using an elastic ponytail band. Glue in eyes, tie stings to the feet, body, head and marionette control. Here it is, the nosey bird. Why is it curious? Because it turns its head round all the time. It looks like we did something wrong with the strings. I would be grateful if somebody can tell me how to fix it. 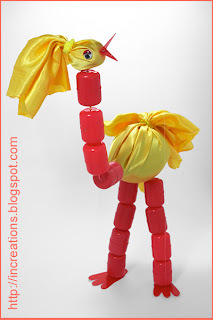 Visit also this link, if you're interested in making a marionette: How to make a marionette.